At Plant Vogtle, safety is our number one priority. Of all the things we do, we are first and foremost committed to ensuring the safety and health of our plant employees and neighbors. We have comprehensive emergency plans in place – in partnership with local, state and federal agencies – that prepare for the unexpected and provide layer upon layer of redundant safety features. Another way we work to keep you safe is by making sure you know exactly how to respond in the unlikely event of a plant emergency. Please familiarize yourself with Plant Vogtle’s emergency information to ensure you’re prepared to protect yourself and your family. We encourage you to bookmark this page on your mobile device. Use these tools to ensure you know how to react in the event of an emergency. Safety is our first value at Southern Nuclear and your family's safety is our priority. Who is Involved in the Emergency Plan? Any serious emergency would generally develop over time. There would normally be plenty of time for you to be notified and for you to take action. For more information about emergency plans, call 706-554-2127. A recorded public information line will be activated in the event of an emergency. Please call 1-888-847-1186 for the latest recorded update. You may also visit www.georgiapower.com for the latest update. To contact the state or your local emergency management agency, use the contact information provided below. WPCH-AM 1380 North Augusta, S.C.
WBBQ-FM 104.3 North Augusta, S.C.
WLUB-FM 105.7 North Augusta, S.C.
WJBF-TV Channel 6 Augusta, Ga.
WRDW-TV Channel 12 Augusta, Ga.
WAGT-TV Channel 26 Augusta, Ga.
WFXG-TV Channel 54 Augusta, Ga.
A false alarm of the emergency sirens is possible because of lightning or other events. If you hear the emergency sirens and you hear NO emergency information on the Emergency Alerting System (EAS) station, then the alarm is probably false. If this happens, please contact the local Emergency Management Agency office with any questions. 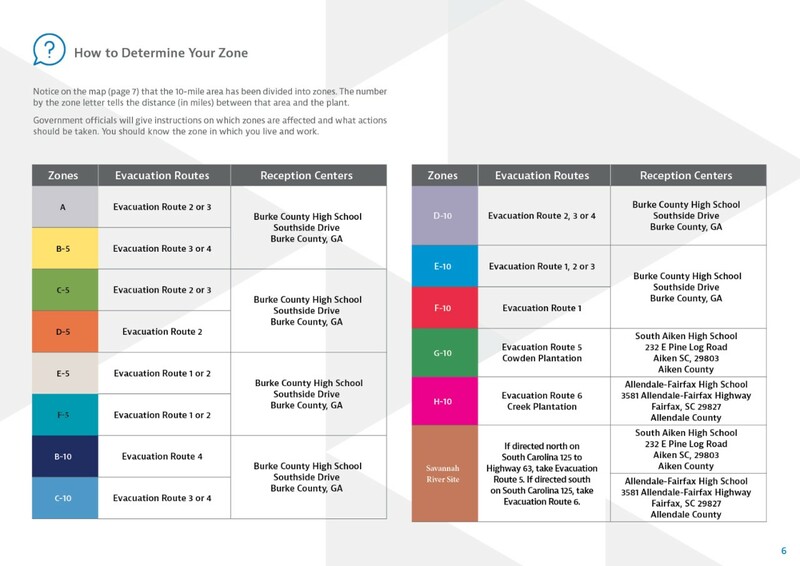 Be prepared to rapidly respond to a plant event by completing this simple evacuation checklist. Click the image to download a PDF ready for you to fill out. Our annual plant calendars provide the comprehensive information you need to respond safely and quickly. In coordination with our local emergency management agencies, we ensure you have all of the information you need in one handy location. 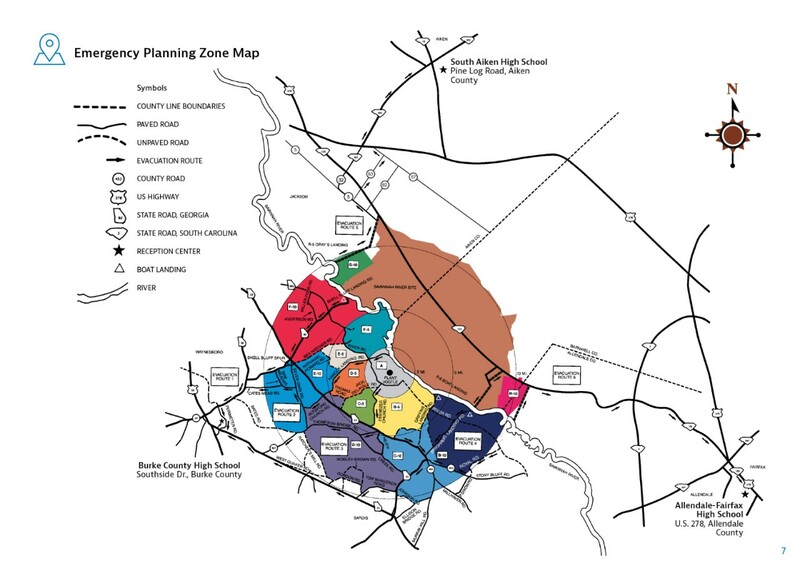 If you reside within the 10-mile emergency planning zone of one of our nuclear facilities, please visit your respective site to learn about information sources, checklists, emergency routes and reception centers.